This MoonTide forecast showed a weak trend in the morning, midday congestion, and a stronger trend after 1:00, running into the end of the day. So the 1ADay trade was set up to go with the trend following the congestion ending near 1:00, trail a 3 point stop that moved 1 point every 30 minutes after entry, and to cover at 3:30 or on a 17 point range. 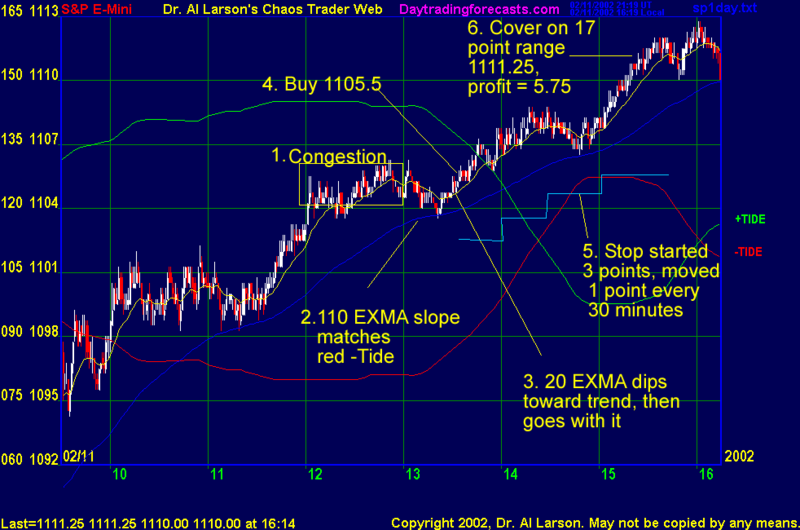 The trend is always shown by the 110 minute blue EXMA. The instructions were to watch for it to begin moving, and to use the yellow 20 minute EXMA as an entry tool, entering when it crossed or dipped toward and pulled away from the 110 EXMA. This trade wound up being a "trend continuation" trade. The forecast MoonTides were close enough to make money. The tracking EXMA's confirmed the Tides, and the trade worked. Remember, the Tides tell you WHEN, and give you an estimate of the extent of a move, and the tracking EXMA's confirm the direction and the timing. Then if you follow the rules, the odds are in your favor.